Accurate clinical diagnosis of deep venous thrombosis (DVT) is notoriously difficult, analogous to accurate clinical diagnosis of pulmonary embolism (PE). Both are part of the same process of venous thromboembolism (VTE). Most cases of DVT are believed to begin in the calves, and approximately 90% of PE cases are believed to originate from the deep veins of the lower extremities and/or the pelvis. DVT usually begins around the leaflets of venous valves, especially in the calves, and can propagate superiorly. Less commonly, DVT can form in the abdominal,pelvic, or upper thigh veins, due to obstruction or other processes, and can then propagate inferiorly. DVT is related to stasis, hypercoagulability, and trauma to the venous wall; ie, Virchow’s triad. Risk factors include various blood disorders, malignancy, estrogen administration, dehydration, recent surgery or trauma, prolonged immobility, heart failure, mass effect on the deep veins, obesity, pregnancy, age > 40, and history of prior DVT. Up to two-thirds of patients with lower extremity (LE) DVT are asymptomatic, but this is very variable, depending on the specific reported series, the patient population, and the technique(s) used to identify or screen for DVT. A multicenter report of > 5000 patients with DVT on ultrasound revealed PE in 14.5%, and 90% of these patients had signs and/or symptoms of DVT and/or PE. In this series there was unilateral LEDVT in 77%, bilateral LE DVT in 12% (with 15% of LE DVT isolated to the calf), and upper extremity (UE) DVT in 11%.1 The prevalence of identifiable DVT in patients with PE is also very variable in the literature.2 Acute DVT may embolize, resolve completely over time, or contractor scar with varying degrees of residual occlusion and obstruction, venous wall thickening, and damaged and incompetent venous valves. With the introduction of ultrasound (US) in the 1980s, and the subsequent universal adoption of US as the initial imaging examination of choice for suspected LE or UE DVT, LE venography is almost never done for diagnosis alone, but is used in conjunction with therapeutic procedures, and has occasional use for upper extremity and central thoracic DVT imaging. 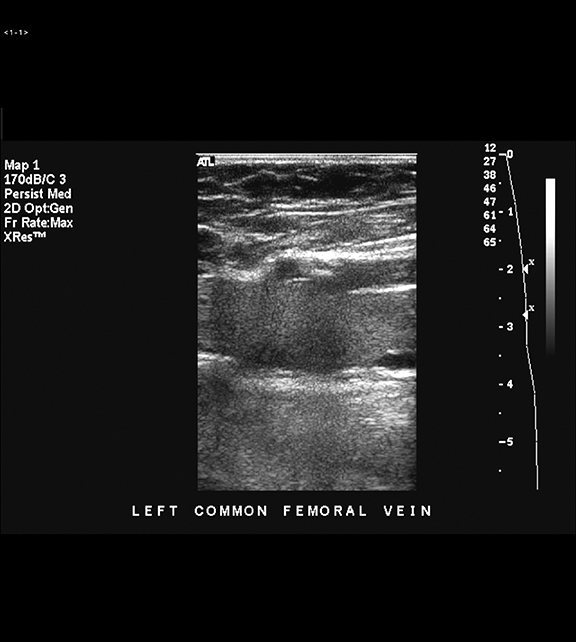 With US, transverse images are routinely obtained, without and with compression of the common femoral vein (CFV), the femoral vein (FV – formerly known as the ‘superficial’ femoral vein), and the popliteal vein (PV) along their course with a 5- or 7.5-MHz linear transducer. 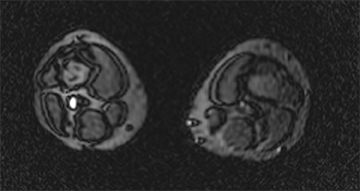 These images are supplemented with sagittal gray scale as well as color and spectral Doppler images (Figures 1 and 2). 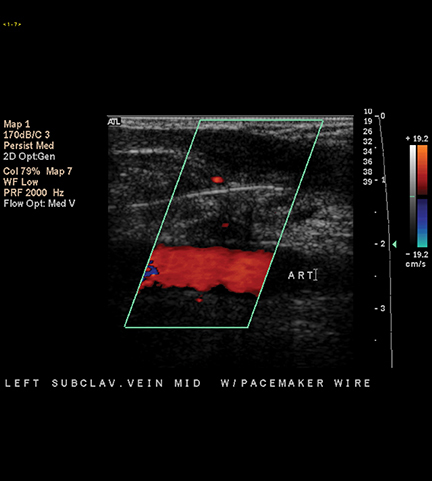 These latter images may be particularly helpful in obese patients, and when imaging deep areas, especially of the FV in the adductor canal.5 Color and spectral Doppler images also provide indirect evidence of pelvic venous occlusion, as a monophasic waveform in the CFV is a reliable indicator of proximal venous obstruction.6 Although routinely performed in our department and elsewhere, augmentation, where the calf is squeezed while simultaneously imaging more proximal deep veins with US, did not yield any additional diagnoses of DVT in a series of almost 2,000 examinations,so its utility is questionable.7 If DVT is not identified, in a minority of patients an alternative diagnosis may be discovered (Figure 3), including hematoma and rupture of a popliteal fossa cyst (Figure 4).8 The accuracy of US for DVT in the thighs of symptomatic patients approaches 100%.9 However, US may be limited in obese patients, in patients with marked LE edema and in patients with overlying casts. Controversy remains over whether to routinely image both lower extremities with US, or whether to image only the symptomatic LE.7,10,11 Isolated contralateral DVT was rare in the series of almost 2,000 examinations,7 and a negative unilateral LE US was associated with a low subsequent DVT and PE risk in a relatively recent meta-analysis.11 However, many centers, including our own, routinely scan both LEs in most patients. Additionally, some authors have advocated a limited US examination, with imaging at the inguinal region and behind the knee only.12 However, up to 20% of patients with DVT isolated to the thigh have the thrombus only in the FV,13-15 so the literature does not support this practice of ‘limited’ US. Potential pitfalls of US imaging for DVT include duplication of the FV, which occurs in upwards of 50% or more of individuals, so if DVT is present in only one limb, US may be falsely negative if only the patent limb is identified (Figure 5).16,17 Also, the IVC and iliac veins are challenging to routinely evaluate with US. In addition, correctly recognizing chronic DVT – and acute superimposed on chronic DVT – is problematic with all noninvasive imaging modalities, including US. Up to 50% of patients on follow-up US for acute DVT may have residual abnormalities.18 Findings of chronic DVT on US include increased clot echogenicity, irregularly thickened venous walls, small caliber veins, and collateral veins (Figure 6). The utility of US in patients with suspected PE but without signs or symptoms of DVT is controversial.15 Proposed algorithms include performing US after an indeterminate ventilation-perfusion scan, or after a nondiagnostic CT pulmonary angiography (CTPA) examination, or as the initial imaging examination, but the incidence of DVT is variable in such patients.14,22,23 If US is done first in patients with suspected PE, but with negative results, then PE is not excluded, while positive results assume—but do not prove—the presence of PE. If actually present, the extent of PE is not known based on US alone. The deep calf veins are typically paired structures that accompany the arteries, but there are also soleal and gastrocnemius veins. The posterior tibial and peroneal veins are located between the calf muscles and are more susceptible to thrombosis, whereas thrombi are less frequent in the anterior tibial veins. 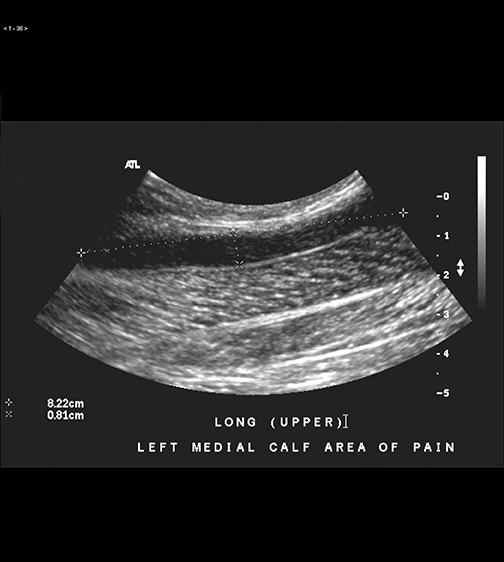 US of the calves is not routinely performed at most centers because of the relatively low accuracy and the high incidence of nondiagnostic examinations.24 However, if a patient specifically reports focal pain in the calf, then an attempt should be made by the sonographer to image this region. The incidence of UE DVT has increased in recent years, due to the more widespread use of central venous catheters, pacemakers, automated implanted defibrillators, and other devices (Figure 8). UE DVT may also occur as a result of hypercoagulability, malignancy, low-flow states, and‘effort’ thrombosis in young athletes (especially in men with underlying thoracic outlet syndrome).34-36 Signs and symptoms of UE DVT include pain and swelling, but are, as with LE DVT, not particularly specific. The exact association of UE DVT with clinically significant PE is not known to our knowledge, although the risk has been estimated at15%.37 However, in a recent series of 300 patients with UE DVT, most of whom were symptomatic, there was a low (2%) incidence of documented pulmonary embolism.38 The initial test of choice for suspected UE DVT as noted is US, which is up to 95% accurate.39 Only the symptomatic side is evaluated, in contrast to LE US. 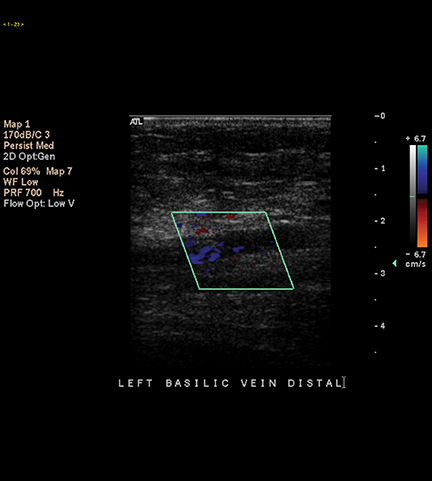 The axillary, brachial, basilic, and internal jugular veins are imaged with compression,supplemented with color and spectral Doppler (Figure 9). 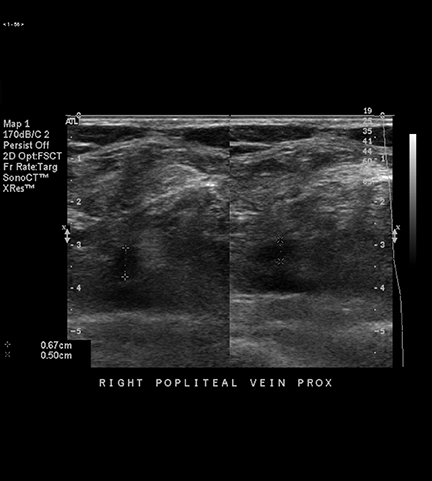 The subclavian vein is not easily compressed due to the overlying clavicle, and the central portions of the brachiocephalic veins are not routinely visualized, so reliance is made on color Doppler and on secondary signs,including absence of pulsatility and respiratory variation in positive cases.37 CT and MR are useful for imaging suspected central venous thrombosis where initial US is equivocal or nondiagnostic (Figure 10). CTV images are acquired at 3 to 3.5 minutes from the start of IV contrast administration for CTPA. 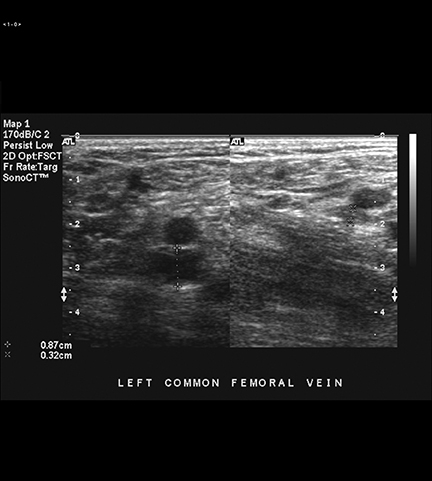 CTV readily reveals complex anatomy and pathology; eg, superficial venous thrombosis with or without concurrent DVT, associated soft-tissue abnormalities, DVT in the profunda femoral vein, which is an area not usually imaged with US; iliac DVT, and calf DVT—although, as noted, the clinical importance of calf DVT remains controversial. But in contrast to its appearance on US, calf DVT is usually obvious on CTV in our experience (Figure 13). There are various controversies regarding CTV: whether to do it at all, when to do it, how to do it (eg, with or without the calves and/or the abdomen and pelvis); whether it is cost effective; and how much evidence supports its use in different scenarios.51-54 Recent literature has been mixed, but is still overall more positive than negative towards the utility of CTV. This reflects the decreased yield of CTV, as CTPAhas become more widely used in recent years, as a result the positive rate of CTPA has decreased, and correspondingly the yield of CTV has decreased. There is also concern regarding the increased radiation exposure of combined CTPA and CTV, compared with CTPA alone.55-61 The most recent literature shows a lower but nontrivial increase of 3% to 11% in the diagnosis of VTE when CTV is added to CTPA (Figure 14).55,56,60-62 The yield of CTV for pelvic DVT identification was higher in the older literature46 and is also greater in high risk patients,57 whereas more recent series have shown a much lower yield for pelvic DVT.59 The recent focus in the literature on CTV in general has been mainly on this lower additional yield, as well as on the high negative predictive value of CTPA alone if negative for subsequent PE. But there are other benefits of performing CTV as noted above, even when CTPA is positive, and there is relative consensus regarding the appropriateness of adding CTV to CTPA in high-risk patients.56-58 We believe the focus should be on reducing unnecessaryCTPA examinations to begin with, rather than on the complete elimination of CTV from CTPA protocols. A relatively small percentage of CTV examinations are nondiagnostic, particularly in patients with poor cardiac function and/or substantial lower extremity atherosclerosis.14,64 Opacification of the deep veins may be suboptimal in these patients, and/or mixing artifacts may be difficult to differentiate from true DVT, although the latter usually has well-defined margins, especially when viewed with narrow windows. In general, if CTV is equivocal or non-diagnostic and/or additional information is needed regarding the lower extremities, US should then be performed. We believe that in this situation and in others that US and CTV are complementary in a subset of patients, and may help to resolve problematic findings encountered on either examination. 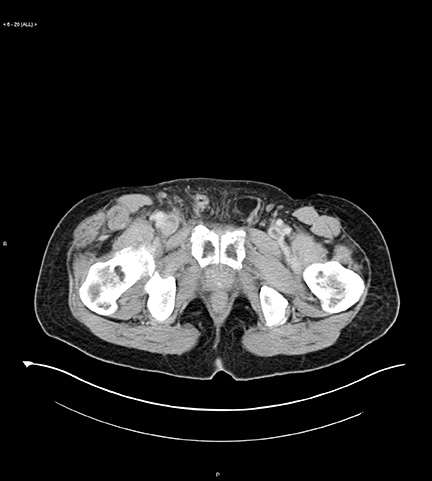 Contiguous multidetector CT venography, with corresponding multiplanar reformations, can be performed to provide detailed information in select patients (eg, those with iliofemoral DVT) or in patients with complex known or suspected venous pathology (eg, in chronic venous insufficiency, where the vascular surgeon is deciding what therapy, if any, is possible).65 In a series of 56 patients with iliofemoral DVT (44 left-sided),volumetric CT venography revealed anatomic abnormalities (particularly compression of the left common iliac vein by the right common iliacartery,which was exaggerated by a bony spur in 9 patients) in 45 patients.66 We use such acquisitions for occasional problem solving – eg, after a nondiagnostic US, without concurrent CTPA. 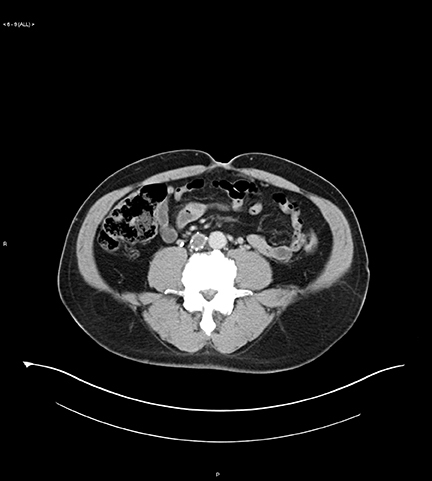 The radiologist should also be aware that, just as patients undergoing contrast-enhanced CT examinations of the chest and/or abdomen will occasionally demonstrate unanticipated PE, periodically they will encounter an unanticipated DVT on abdominal and pelvic CT, which could be missed if not included in the search pattern (Figure 16). In some cases, the diagnosis will be apparent even though delayed images were not specifically obtained (to optimize opacification of the systemic veins and to simultaneously decrease mixing artifacts, as with CTV), whereas in other cases the diagnosis may be difficult, and if the patient has already left the CT suite, confirmatory US may be indicated to resolve the issue. 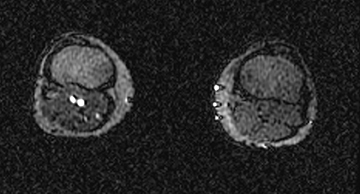 MR venography has high accuracy compared with conventional venography for the pelvic and thigh veins, but is less accurate for the calves.A variety of sequences can be utilized, including spin-echo, gradient-recalled echo, and gadolinium-enhanced images.67-69 MRV is also advantageous for imaging suspected central thoracic venous thrombosis: The veins are readily evaluated, in contrast to US, and the cause of thrombosis—eg, a central mass—can be identified. 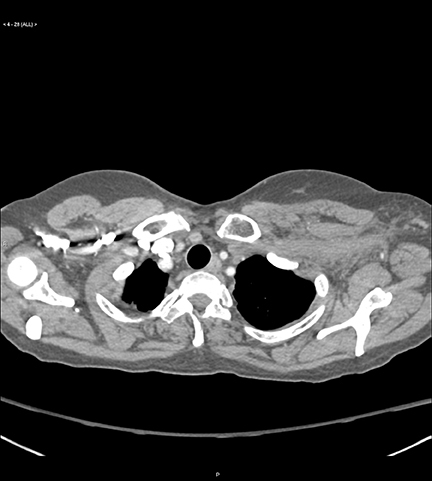 Central thoracic DVT can also be identified on CTPA/routine contrast-enhanced chest CT, although evaluation may be difficult on the former due to the arterial phase of image acquisition. Conventional catheter diagnostic venography (Figure 18) is now limited to specific scenarios: prior to placement of IVC filters; evaluation of central DVT in the proximal arms and thorax; as a prelude to interventions, such as thrombolysis, thrombectomy, and stent placement; with indeterminate US in obese patients or patients with a markedly swollen leg; and when other modalities do not or cannot solve a specific problem (eg, in suspected calf DVT in patients with negative or indeterminate US, where the findings would potentially change management, although this scenario can be also evaluated with CTV or MRV). When portions of the subclavian and innominate veins and superior vena cava cannot be visualized, which as noted is a common situation with US, reliable evaluation can be performed with catheter venography, with a contrast injection into the antecubital vein or via basilic or brachial vein access, with catheterization of the subclavian vein, under fluoroscopic control. Conventional venography is performed routinely immediately prior to IVC filter placement, to evaluate for thrombosis in the path of the filter deployment, to search for an underlying venous anomaly, and also to measure the IVC to determine the type and size of filter to place. At our institution, we routinely hand inject into the ipsilateral iliac vein when planning to place an IVC filter via the femoral approach, to evaluate for iliac DVT. 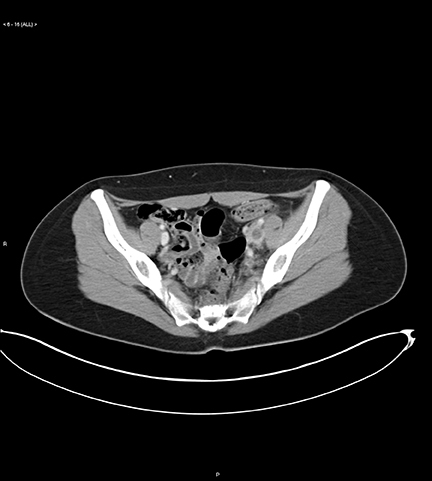 We then perform an “IVC gram” via a left iliac venous injection to look for congenital anomalies. We then perform a selective left renal venogram to check for a circumaortic renal vein, which can serve as a collateral pathway for emboli around the IVC. Ultrasound is the imaging examination of choice for suspected lower- or upper-extremity deep venous thrombosis. 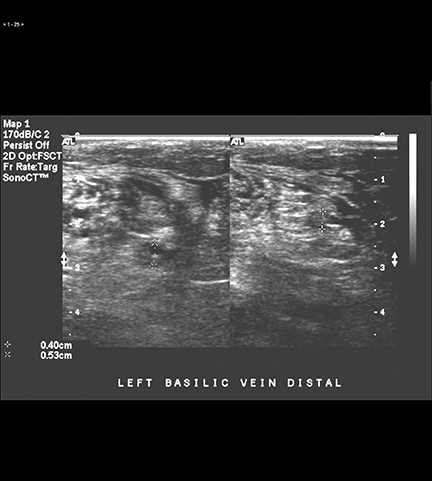 Ultrasound has high accuracy in symptomatic patients for evaluation of the deep thigh veins and the central arm veins. 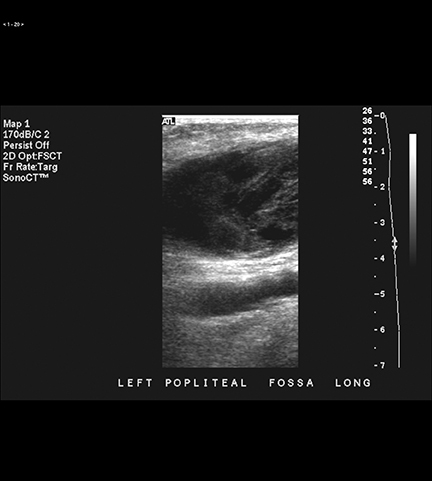 Ultrasound is less accurate for the calf and pelvic veins and in asymptomatic patients. Combined CT pulmonary angiography and CT venography permits comprehensive assessment for pulmonary embolism and deep venous thrombosis, and serves as a road map for therapy, although the reported yield of CT venography has decreased substantially in recent years as CTPA has been increasingly utilized/over-utilized, and CTV is not routinely performed in conjunction with CTPA at most institutions/practices, although there is still evidence to support its use, especially in high-risk patients. MR venography is a helpful problem-solving examination, and can be combined with MR pulmonary angiography. Conventional venography is mostly of historical interest when used solely as a diagnostic examination for the lower extremities, although venography via an inguinal approach is still performed at some centers, including ours, as a road-mapping technique immediately prior to IVC filter placement. Venography of the lower and upper extremities is also routinely performed as part of a variety of therapeutic procedures for DVT, including thrombolysis, percutaneous thrombectomy, angioplasty, and stent placement. Goldhaber SZ, Tapson VF. A prospective registry of 5,451 patients with ultrasound-confirmed deep vein thrombosis. Am J Cardiol. 2004;93:259-262. Schwartz T, Hingorani A, Ascher E, et al. 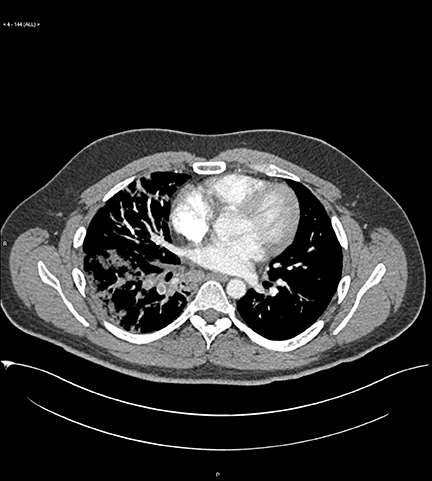 Pulmonary embolism without deep venous thrombosis. Ann Vasc Surg. 2012;26:973-976. Redman HC. Deep venous thrombosis: Is contrast venography still the diagnostic “gold standard”? Radiology. 1988;168:277-278. Lewis BD. The peripheral veins. In: Rumack CM, Wilson SR, Charboneau JW, eds. Diagnostic Ultrasound. 2nd ed. St. Louis, MO: Mosby; 1998:943-958. Lewis BD, James EM, Welch TJ, et al. 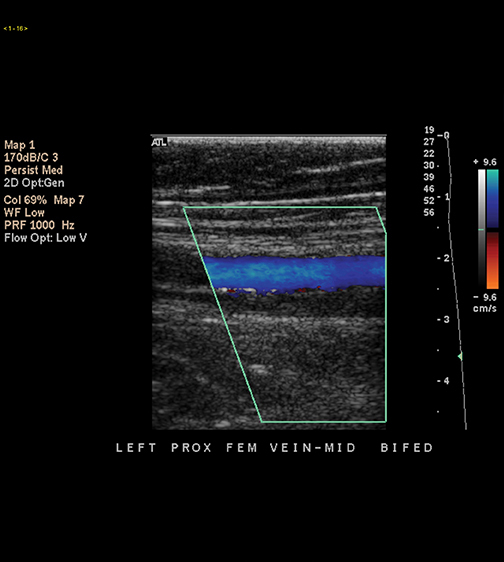 Diagnosis of acute deep venous thrombosis of the lower extremities: Prospective evaluation of color Doppler flow imaging versus venography. Radiology. 1994;192:651-655. Lin EP, Bhatt S, Rubens D, Dogra VS. The importance of monophasic Doppler waveforms in the common femoral vein: A retrospective study. J Ultrasound Med. 2007;26:885-891. Lockhart ME, Sheldon HI, Robbin ML. 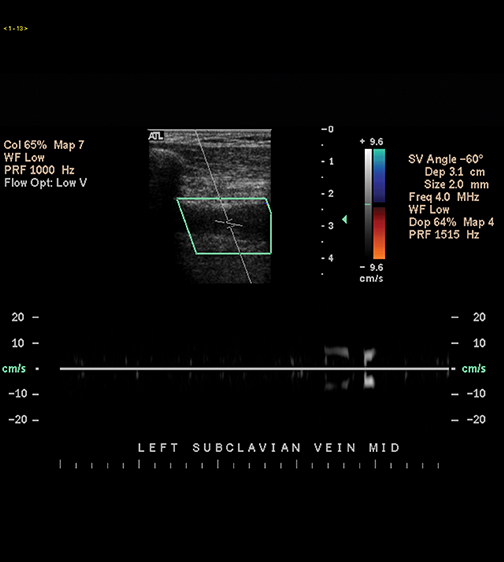 Augmentation in lower extremity sonography for the detection of deep venous thrombosis. AJR Am J Roentgenol. 2005;184:419-422. Sutter ME, Tumipseed SD, Diercks DB, et al. Venous ultrasound testing for suspected thrombosis: Incidence of significant non-thrombotic findings. J Emerg Med. 2009;36:55-59. Fraser JD, Anderson DR. Deep venous thrombosis: Recent advances and optimal investigation with US. Radiology. 1999;211:9-24. Rosen MP, McArdle C. Controversies in the use of lower extremity sonography in the diagnosis of acute venous thrombosis and a proposal for a unified approach. Semin US CT MRI. 1997;18:362-368. Johnson SA, Stevens SM, Woller SC, et al. Risk of deep vein thrombosis following a single negative whole-leg compression ultrasound: a systematic review and meta-analysis. JAMA. 2010;303:438-445. Pezzullo JA, Perkins AB, Cronan JJ. Symptomatic deep venous thrombosis: diagnosis with limited compression US. Radiology. 1996;198:67-70. Maki DD, Kumar N, Nguyen B, et al. 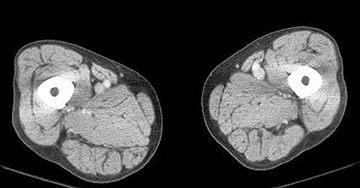 Distribution of thrombi in acute lower extremity deep venous thrombosis: implications for sonography and CT and MR venography. AJR AM J Roentgenol. 2000;175:1299-1301. Katz DS, Loud PA, Bruce D, et al. Combined CT venography and pulmonary angiography: a comprehensive review. RadioGraphics. 2002;22: S3-S24. Fard MN, Mostaan M, Anaraki MR. Utility of lower-extremity duplex sonography in patients with venous thromboembolism. J Clin Ultrasound. 2001;29:92-98. Screaton NJ, Gillard JH, Berman LH, Kemp PM. 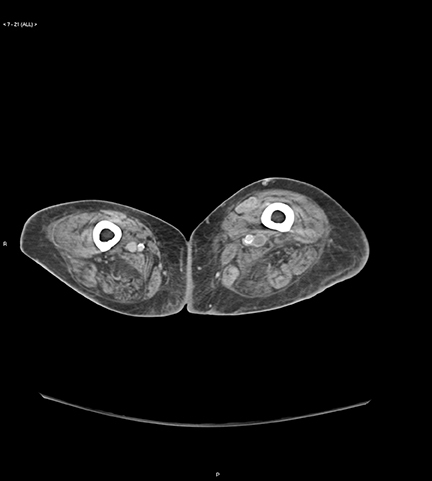 Duplicated superficial femoral veins: A source of error in the sonographic investigation of deep vein thrombosis. Radiology. 1998;206:397-401. Quinlan DJ, Alikhan R, Gishen P, Sidhu PS. Variations in lower limb venous anatomy: Implications for US diagnosis of deep vein thrombosis. Radiology. 2003;228:443-448. Murphy TP, Cronin JJ. Evaluation of deep venous thrombosis: A prospective evaluation with US. Radiology. 1990;177:543-548. Spritzer CE, Trotter P, Sostman HD. Deep venous thrombosis: Gradient-recalled-echo imaging changes over time – experience in 10 patients. Radiology. 1998;208:631-639. Siragusa S, Malato A, Anastasio R, et al. Residual vein thrombosis to establish duration of anticoagulation after a first episode of deep venous thrombosis: The Duration of Anticoagulation based on Compression UltraSonography (DACUS) study. Blood. 2008;112:511-515. Wells PS, Lensing AW, Davidson BL, et al. Accuracy of ultrasound for the diagnosis of deep venous thrombosis in asymptomatic patients after orthopedic surgery. A meta-analysis. Ann Intern Med. 1995;73:47-53. Girard P, Sanchez O, Leroyer C, et al. Deep venous thrombosis in patients with acute pulmonary embolism: Prevalence, risk factors, and clinical significance. Chest. 1999;128:1593-1600. Turkstra F, Kuijer PM, van Beek EJ, et al. Diagnostic utility of ultrasonography of leg veins in patients suspected of having pulmonary embolism. Ann Intern Med. 1997;126:775-781. Gottlieb RH, Widjaja J, Tian L, et al. 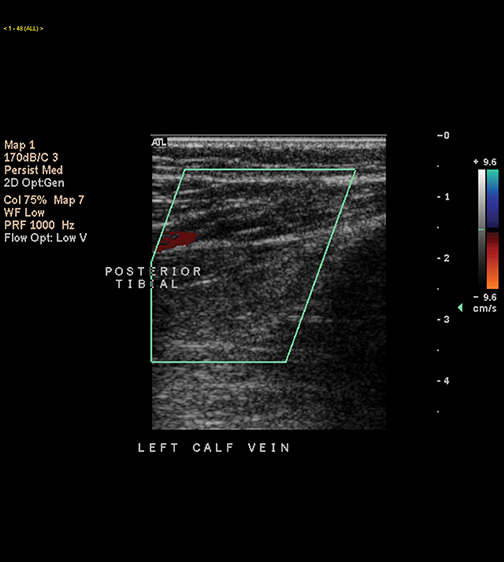 Calf sonography for detecting deep venous thrombosis in symptomatic patients: Experience and review of the literature. 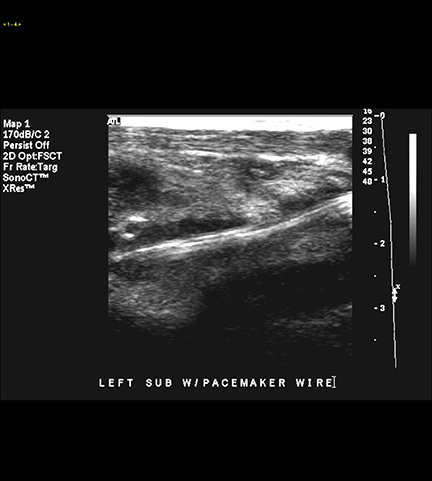 J Clin Ultrasound. 1999;27:415-420. Hirsh J, Guyatt G, Albers GW, et al. Antithrombotic and thrombolytic therapy: American College of Chest Physicians evidence-based clinical practice guidelines (8th edition). Chest. 2008;133(6 Suppl):110S-112S. Masoda EM, Kistner RL, Musikasinthorn C, et al. The controversy of managing calf vein thrombosis. J Vasc Surg. 2012;55:550-561. Singh K, Yakoub D, Giangola P, et al. 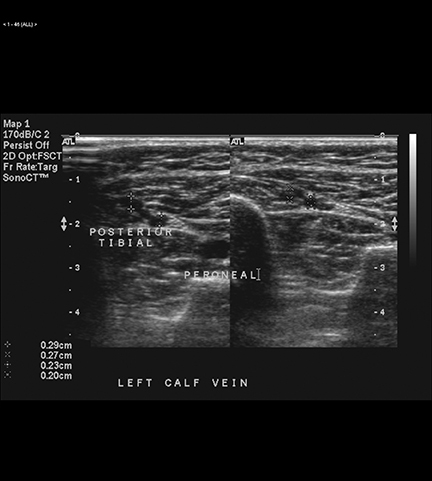 Early follow-up and treatment recommendations for isolated calf deep venous thrombosis. J Vasc Surg. 2012;55:136-140. DeMartino RR, Wallaert JB, Rossi AP, et al. A meta-analysis of anticoagulation for calf deep venous thrombosis. J Vasc Surg. 2012;56:228-237. Deitcher SR, Caprini JA. Calf deep venous thrombosis should be treated with anticoagulation. Med Clin North Am. 2003;87:1157-1164. Subramaniam RM, Heath R, Chou Tet al. Deep venous thrombosis: Withholding anticoagulation therapy after negative complete lower limb US findings. Radiology. 2005;237:348-352. Rose SC, Zwiebel WJ, Miller FJ. Distribution of acute lower extremity deep venous thrombosis in symptomatic and asymptomatic patients: Imaging implications. J Ultrasound Med. 1994;13:243-250. Yoshimura N, Hori Y, Horri Y, et al. Where is the most common site of DVT? Evaluation by CT venography. Jpn J Radiol. 2012;30:393-397. 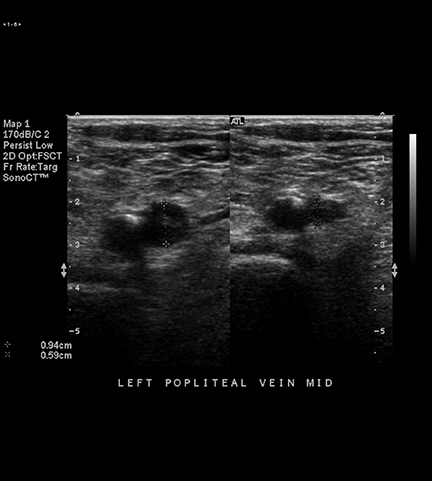 McIlrath ST, Blaivas M, Lyon M. Patient follow-up after negative lower extremity bedside ultrasound for deep venous thrombosis in the ED. Am J Emerg Med. 2006;24:325-328. Volturo CA, Repeta RJ Jr. Non-lower extremity deep vein thrombosis. Emerg Med Clin North Am. 1994;19:877-893. Gaitini D, Beck-Razi N, Haim N, Brenner B. Prevalence of upper extremity deep venous thrombosis diagnosed by color Doppler duplex sonography in cancer patients with central venous catheters. J Ultrasound Med. 2006;25:1297-1303. Grant JD, Stevens SM, Woller SC, et al. 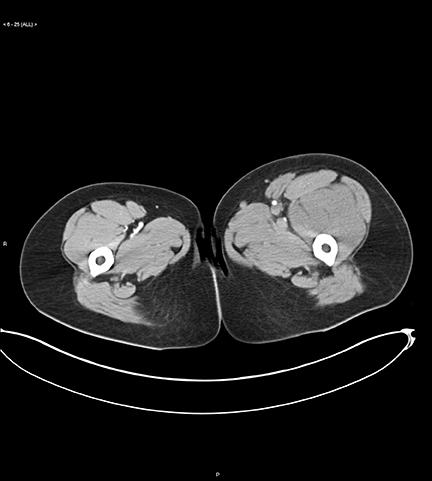 Diagnosis and management of upper extremity deep-vein thrombosis in adults. Thromb Haemost. 2012;108:1097-1108. Giess CS, Thaler H, Bach AM, Hann LE. Clinical experience with upper extremity venous sonography in a high-risk cancer population. J Ultrasound Med. 2002;21:1365-1370. Levy MM, Albuquerque F, Pfeifer JD. 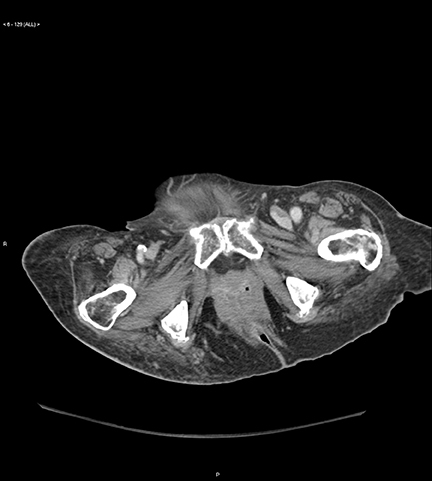 Low incidence of pulmonary embolism associated with upper-extremity deep venous thrombosis. Ann Vasc Surg. 2012;26:964-972. Desjardins B, Rybicki FJ, Kim HS, et al. ACR Appropriateness Criteria: Suspected upper extremity deep vein thrombosis. J Am Coll Radiol. 2012;9:613-619. Loud PA, Grossman ZD, Klippenstein DL, Ray CE. Combined CT venography and pulmonary angiography: A new diagnostic technique for suspected thromboembolic disease. AJR Am J Roentgenol. 1998;170:951-954. Loud PA, Katz DS, Bruce DA, et al. Deep venous thrombosis with suspected pulmonary embolism: Detection with combined CT venography and pulmonary angiography. Radiology. 2001;219:498-502. Fujikawa A, Matsuoka S, Kuramochi K, et al. Vascular enhancement and image quality of CT venography: Comparison of standard and low kilovoltage settings. AJR Am J Roentgenol. 2011;197:838-843. Nakaura T, Awai K, Oda S, et al. A low-kilovoltage (peak) high-tube current technique improves venous enhancement and reduces the radiation dose at indirect multidetector-row CT venography: Initial experience. J Comput Assist Tomogr. 2011;35:141-147. Oda S, Utsunomiya D, Funama Y, et al. Evaluation of deep vein thrombosis with reduced radiation and contrast material dose at computed tomography venography. Circ J. 2012;76:2614-2622. Kulkarni NM, Sahani DV, Sesai GS, Kalva SP. 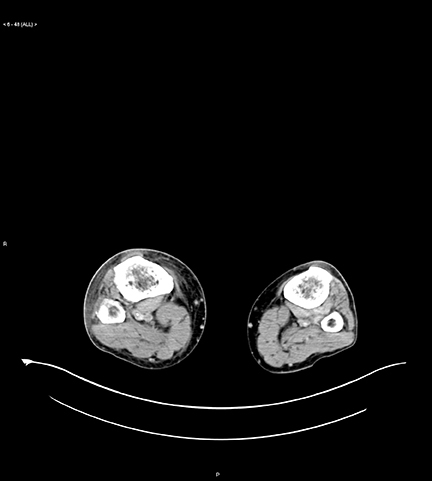 Indirect computed tomography venography of the lower extremities using single-source dual-energy computed tomography: advantage of low-kiloelectron volt monochromatic images. J Vasc Interv Radiol. 2012 23:879-886. Cham MD, Yankelevitz DF, Henschke CI. Thromboembolic disease detection at indirect CT venography versus CT pulmonary angiography. Radiology. 2005;234:591-594. Ghaye B, Nchimi A, Noukoua CT, Dondelinger RF. Does multi-detector row CT pulmonary angiography reduce the incremental value of indirect CT venography compared with single-detector row CT pulmonary angiography? Radiology. 2006;240:256-262. Richman PB, Wood J, Kasper DM, et al. Contribution of indirect computed tomography venography to computed tomographic angiography of the chest for the diagnosis of thromboembolic disease in two United States emergency departments. J Thromb Hemost. 2003;1:652-657. Stein PD, Fowler SE, Goodman LR, et al. Multidetector computed tomography for acute pulmonary embolism. N Engl J Med. 2006;354:2317-2327. Goodman LR, Stein PD, Matta F, et al. CT venography and compression sonography are diagnostically equivalent: Data from PIOPED II. AJR Am J Roentgenol. 2007;189:10711076. Dodd JD. Evidence-based practice in radiology: steps 3 and 4 – appraise and apply diagnostic radiology literature. Radiology. 2007;242:342-354. Goodman LR, Sostman HD, Stein PD, Woodard PK. CT venography: A necessary adjunct to CT pulmonary angiography, or a waste of time, money, and radiation? Radiology. 2009;250:327-330. Hunsaker AR, Zou KH, Poh AC, et al. 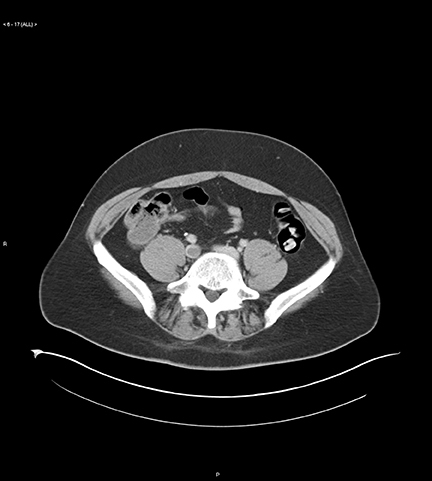 Routine pelvic and lower extremity CT venography in patients undergoing pulmonary CT angiography. AJR Am J Roentgenol. 2008;190:322-326. 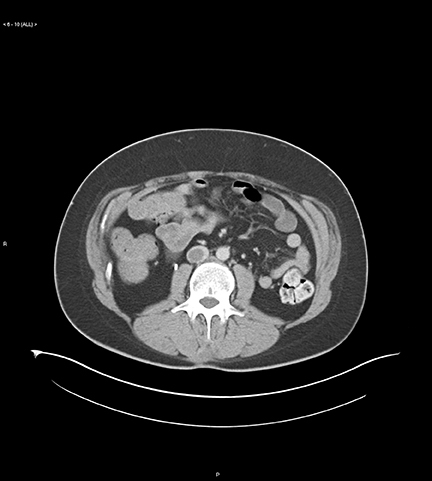 Kalva SP, Jagannathan JP, Hahn PF, Wicky ST. Venous thromboembolism: Indirect CT venography during CT pulmonary angiography – should the pelvis be imaged? Radiology. 2008;246:605-611. Nazaroglu H, Ozmen CA, Akay HO, et al. 64-MDCT pulmonary angiography and CT venography in the diagnosis of thromboembolic disease. AJR Am J Roentgenol. 2009;192:654-661. Stein PD, Matta F, Yaekoub AY, et al. 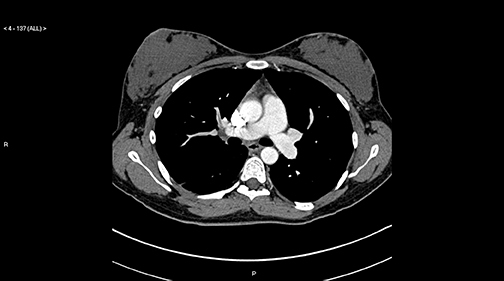 CT venous phase venography with 64-detector CT angiography in the diagnosis of acute pulmonary embolism. Clin Appl Thromb Hemost. 2010;16:422-429. Revel MP, Sanchez O, Dechoux S, et al. 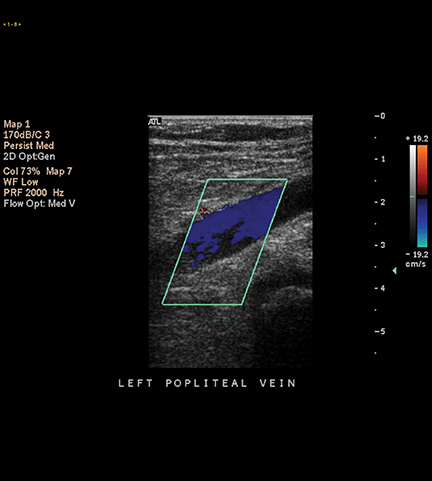 Contribution of indirect computed tomographic venography to the diagnosis of postpartum venous thromboembolism. J Thromb Hemost. 2009;6:1478-1481. Ravenel J, Northam MC, Nguyen SA. Negative predictive value of computed tomography pulmonary angiography with indirect computed tomography venography in intensive care unit patients. J Comput Assist Tomogr. 2009;33:739-742. Reichert M, Henzler T, Krissak R, et al. 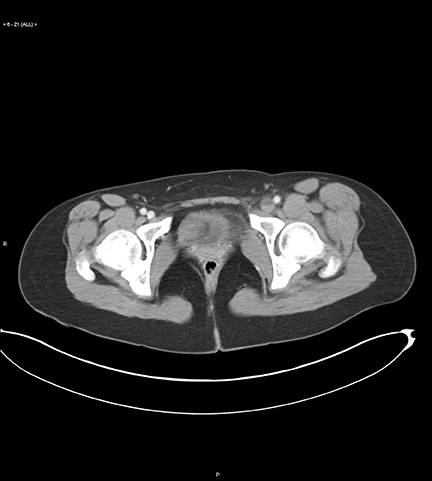 Venous thromboembolism: Additional diagnostic value and radiation dose of pelvic CT venography in patients with suspected pulmonary embolism. Eur J Radiol. 2011;80:50-53. Slater S, Oswal D, Bhartia B. 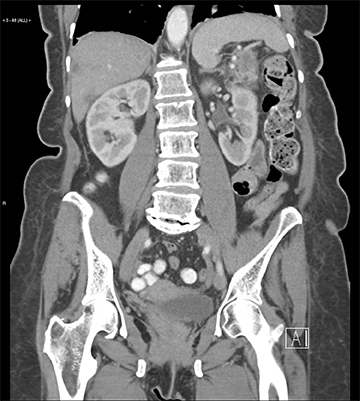 A retrospective study of the value of indirect CT venography: A British perspective. Br J Radiol. 2012;85:917-920. Krishan S, Panditaratne N, Verma R, Robertson R. Incremental value of CT venography combined with pulmonary CT angiography for the detection of thromboembolic disease: systematic review and meta-analysis. AJR Am J Roentgenol. 2011;196:1065-1072. Darze ES, Braghiroli JF, Almeida RV, et al. Clinical outcomes after investigation for pulmonary embolism using CT angiography and venography. Arq Bras Cardiol. 2012;99:740-746. Park EA, Lee W, Lee MW, et al. 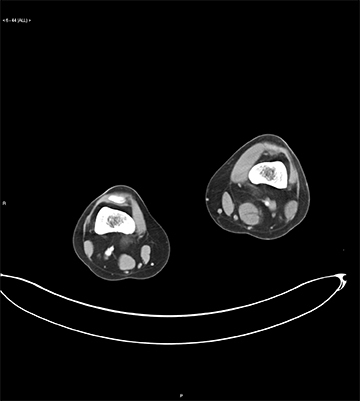 Chronic-stage deep vein thrombosis of the lower extremities: Indirect CT venographic findings. J Comput Assist Tomogr. 2007;31:649-656. Arakawa H, Kohno T, Hiki T, Kaji Y. CT pulmonary angiography and CT venography: Factors associated with vessel enhancement. AJR Am J Roentgenol. 2007;189:156-161. Uhl JF. Three-dimensional modeling of the venous system by direct multislice helical computed tomography venography: Technique, indications, and results. Phlebology. 2012;27:270-288. Chung JW, Yoon CJ, Jung SI, et al. 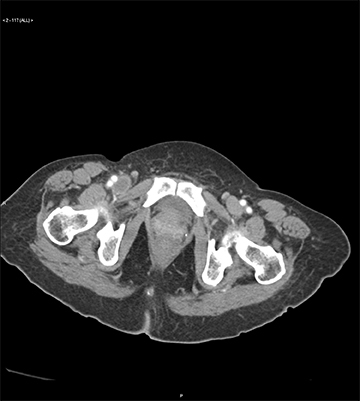 Acute iliofemoral deep vein thrombosis: Evaluation of underlying anatomic abnormalities by spiral CT venography. J Vasc Interv Radiol. 2004;15:249-256. Cantwell CP, Cradock A, Bruzzi J, et al. MR venography with true fast imaging with steady-state precession for suspected lower-limb deep vein thrombosis. J Vasc Interv Radiol. 2006;17:1763-1769. Hanasch A, Betge S, Poehlmann G, et al. Combined magnetic resonance imaging of deep venous thrombosis and pulmonary arteries after a single injection of a blood pool contrast agent. Eur Radiol. 2011;21:318-325. Lindquist CM, Karlicki F, Lawrence P, et al. Utility of balanced steady-state free precession MR venography in the diagnosis of lower extremity deep venous thrombosis. AJR Am J Roentgenol; 2010:194:1357-1364. Spritzer CE, Arata MA, Freed KS. 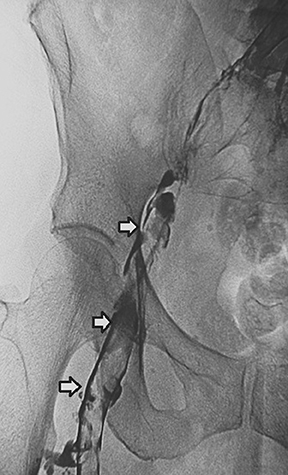 Isolated pelvic deep venous thrombosis: relative frequency as detected with MR imaging. Radiology. 2001;219:521-525. Borst-Krafek B, Fink AM, Lipp C, et al. Proximal extent of pelvic vein thrombosis and it association with pulmonary embolism. J Vasc Surg. 2003; 37:518-522. Gary T, Steidl K, Belaj K, et al. Unusual deep venous thrombosis sites: Magnetic resonance venography in patients with negative compression ultrasound and symptomatic pulmonary embolism. Phlebology. 2012 Nov 30 (epub). Kluge A, Mueller C, Strunk J, et al. Experience in 207 combined MRI examinations for acute pulmonary embolism and deep vein thrombosis. AJR Am J Roentgenol. 2006;186:1686-1696. Hadizadeh DR, Kukuk GM, Fahlenkamp UL, et al. Simultaneous MR arteriography and venography with blood pool contrast agent detects deep venous thrombosis in suspected arterial disease. AJR Am J Roentgenol. 2012;198:1188-1195. Imaging of deep venous thrombosis: A multimodality overview. Appl Radiol. Dr. Katz is Director of Body Imaging and Vice Chair for Clinical Research and Education, Winthrop-University Hospital, Mineola, Long Island, NewYork, and Professor of Clinical Radiology at the School of Medicine of the State University of New York at Stony Brook, Dr. Fruauff is a resident in radiology at Cornell University, Dr. Kranz is an Attending Radiologist at Winthrop and Assistant Professor of Clinical Radiology at Stony Brook, and Dr. Hon is Vice Chair for Operations in the Department of Radiology at Winthrop, Director of Interventional Radiology, and Associate Professor of Clinical Radiology at Stony Brook.